This bottle looked decidedly Alsacian, possibly German, but it’s Hungarian. It arrived in a mixed bargain box from Berry Brothers and Rudd, who always have something interesting on offer in their sales. The wine starts out being interesting, instead of a cork it has an elegant glass stopper under the foil. I don’t know why, but it felt fancy. It was also a reminder to move the other bottle up the drinking order, I don’t know how well an on sale wine fares under a glass stopper with a plastic seal rather than cork. The wine is called J after the grape variety, Juhfark, which is named after the way the grapes grow, in a bunch shaped like a J. The producers boast that their Hungarian heritage makes them great winemakers, but the Dutch side of their family instilled business sense and order to their production. I would like to have sat in on some of those meetings over the generations as they sorted out their rows. One of the family was a wine writer, you can find his site here, but it seems to have been abandoned a couple of years ago, along with the company website which does not seem to have had an update since 2013. It smelled vaguely Alsacian too, it had some tropicality and spiciness as well as something freshly floral. It was a pale golden colour, without much in the way of legs. 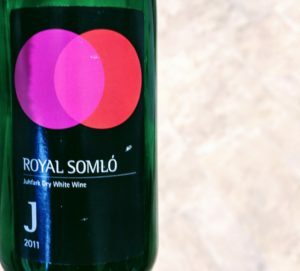 Royal Somlo J tasted fresh, it’s dry, but that fruit gives it a sweet edge, there’s a medium acidity and something of a mineral zip to it, almost like an Italian volcanic wine. The fruit ladles on, with peach and non specific tropical fruits that could lean pineapple in one mouthful and passion fruit in the next, yet always fresh and juicy. There’s a mild spiciness, but more pepper that sweet spice. That may not sound like a great combo, but it really is refreshing. I enjoyed Royal Somlo and will look out for it again as a zippy, fruity break from the norm.